If Tumblr is more of a social network than a blogging platform, then Babblr may be just the thing that its users are clamoring for: It’s an integrated chat client for the platform that lets you communicate with your Tumblr friends and followers and organize your community into groups. The idea, now in beta, comes from a few folks who currently work at social good e-commerce company Sevenly. They’re all active Tumblr users themselves, and were inspired to build Babblr because of their own passion for Tumblr and social media in general. According to Babblr co-founder Brandon Sowers, between himself and Babblr’s other creators, Brett Williams and Trevor Clarke, they have a combined 700,000 Tumblr followers. “We’re always looking at new, innovative ways to communicate with our fans,” says Sowers. Today, Tumblr’s social features are more lightweight – its users can follow others’ blogs, favorite posts, and re-blog content while adding their own 2 cents, but direct communication between users isn’t possible. Babblr isn’t overly complex software. It’s not that much different from other on-site chat clients, in fact. The difference is that it’s built on top of the Tumblr API, and through a Chrome extension launching in a few weeks, it will integrate directly into your Tumblr dashboard. After authenticating with Tumblr, the Babblr interface shows you a list of followers and those you’re following, and lets you initiate instant messaging-like chats with others on Babblr. You can also organize your followers into groups, which is useful for those with larger communities, or who just want to have more directed conversations. “We got 25,000 emails that day from people wanting whatever this chat was at the time,” says Sowers. “It’s pretty insane when you see something like that,” he adds. Of the now 25,000 users who have set up Babblr accounts, the majority of them are female, ages 16 through 24 – something which lends support to reports of Tumblr’s popularity among a younger demographic. Around 80 percent of those who signed up are also U.S.-based. Today’s “launch” of Babblr is still really more of a sneak peek than it is a public debut. 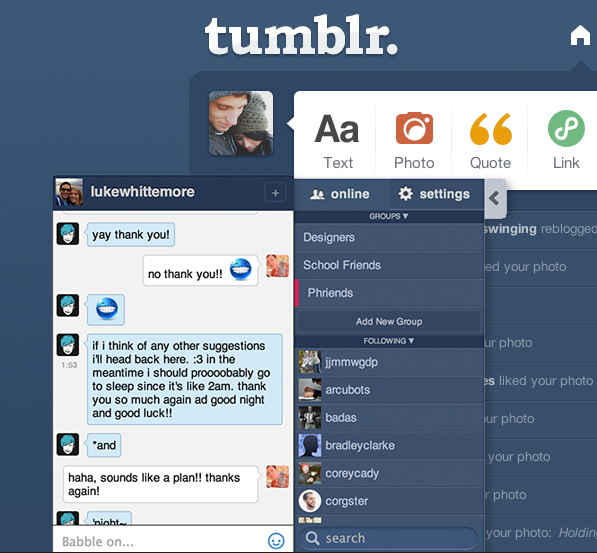 The client is in beta and won’t be available on Tumblr dashboards until the Chrome extension is finished up. But Sowers says that part is almost done. When Babblr launches in a couple of weeks, it will be free to download, but the plan is to shortly thereafter begin charging a 99-cent fee for the download after word spreads. All three co-founders still work at Sevenly and are bootstrapping the project with their own “passion, sweat and tears,” says Sowers. You can test out Babblr for yourself here. More to come.